Last Sunday the bitter cold and extreme wind event may have postponed the 2013 Bear Pond Snowshoe for one week, and the National Weather Service prediction of BIG snow for Sunday the 24th may have scared some awayâ€¦.but, yet again, Bear Pond did not disappoint! Fifteen hearty explorers wound their way through the frozen wooded swamp in a light snow to reach Bear Pond, a remote kettle pond and quaking bog which supports all kinds of crazy plants and animals. 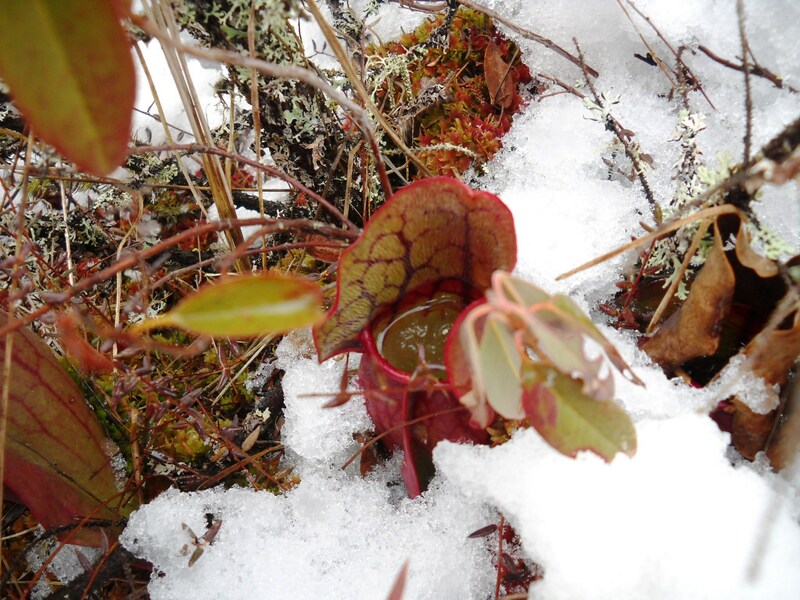 Upon reaching the pond, everyone was â€œset freeâ€ to explore on their ownâ€¦using the time to practice winter identification of plants, follow tracks into the shrubs, search small open water areas, and even test the depths with one boot! 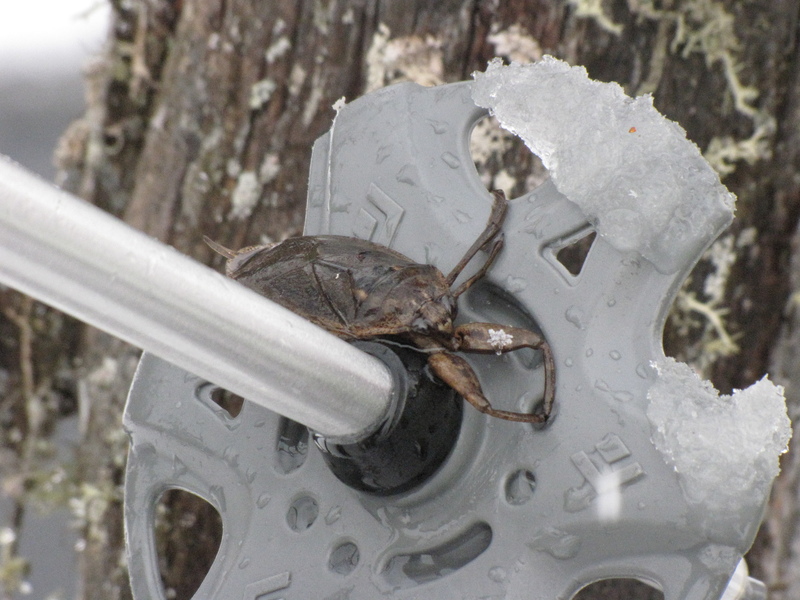 While there was a lot to see, probably the coolest thing we saw was a Giant Water Bug!Â A water bug in winter you ask?Â You betchya!Â In one of the small openings in the ice, this â€œlittleâ€ feller lived up to its name measuring almost 2.5 inches in length!Â Fortunately for us, it wasnâ€™t moving too quickly in the cold water so we were able to look at it quite closely.Â Â Here is a video of the natural history of this guyâ€¦pretty amazing creature. Â We even saw three Eastern Newtsâ€¦in their aquatic stage!Â This is the same critter that many of you know as a Red Eft (which is its much longer terrestrial stage).Â What crazy things to find on a snowshoe walk in February! The Bear Pond Natural Area (owned by the Mascoma Watershed Conservation Council), along with other adjacent UVLT conserved properties, makes up over 1000 acres of natural habitat.Â You never quite know what you might see out thereâ€¦and this yearâ€™s snowshoe brought out even more unusual finds!Â Join the Upper Valley Land Trust and our partners in our next adventure! Â Come explore with us! https://uvlt.org/wp-content/uploads/2014/02/logo_banner221.gif 0 0 Jeanie McIntyre https://uvlt.org/wp-content/uploads/2014/02/logo_banner221.gif Jeanie McIntyre2013-02-26 14:05:192013-12-21 17:43:47What do you find in a frozen bog?